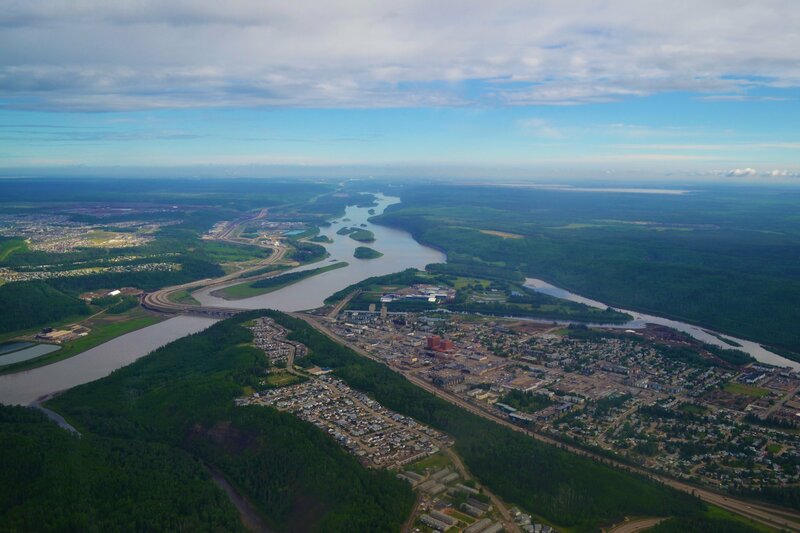 Photo credit: Aerial view of Fort McMurray by Sara Venskaitis. Picture this. You’re flying in a small plane in the skies above Alberta somewhere near Edmonton. You look down… you see a tract of native aspen parkland, bisected by a road, and rimmed by farm fields and newly established residential areas. Pockets of industrial activity can be seen in all directions. Now imagine, what does the view look like in 10 years, 20 years, and beyond? How does the landscape change? This thought experiment isn’t just a fun challenge. ABMI defines human footprint as the visible conversion of native ecosystems to temporary or permanent residential, recreational, agricultural or industrial landscapes. Understanding changes in human footprint is essential to understanding how biodiversity is changing over time, and what kinds of human activity are driving that change. Monitoring human footprint is crucial to creating land use plans, implementing effective policies, and monitoring progress against set land use objectives. Given the value of human footprint data, a number of players have been involved over the years in collecting, curating, and distributing this data in Alberta. And, as the need for this data and information continues to grow, the call for coordinating data collection efforts has grown as well. Coordination and management of collection efforts is essential when trying to avoid gaps in information, ensure implementation of standard data protocols, and provide universal access to all the data. Until recently, coordination of human footprint data collection in Alberta has been broad and conducted by a host of various organizations. As a result, the ABMI and Alberta Environment and Parks (AEP) founded the Alberta Human Footprint Monitoring Program (AHFMP) in 2015 and continue to lead its development. The AHFMP is intended to be the source for standardized, publicly-available, and scientifically credible human footprint data and information in Alberta. To ensure the success and responsiveness of the AHFMP, its Steering and Technical Committees are comprised of a balanced set of stakeholder representatives from government, industry, academia and non-government environmental organizations. It’s good to see the collaboration between the various organizations.This is a collaborative approach. The AHFMP builds and proposes potential solutions for various footprint types. We use a peer review process to ensure we are on the right track, including subject matter experts who need and understand the datasets, experts who understand the life cycle of the features, as well as GIS and remote sensing experts who evaluate the process. In addition to generating data, the role of the AHFMP is also to coordinate the collection of source data from authoritative sources. Thus far, the AHFMP has focussed on enhancing the ABMI’s human footprint data to provide more attribute information, such as when the disturbance occurred and what the reclamation status is. For example, well pads* have been updated using the Alberta Environment and Parks’ Digitally Integrated Dispositions (DIDs) dataset, with several other feature types in progress, such as roads. In the long-term, the AHFMP would also like to include human footprint data provided directly by industry. “I am very excited about this collaborative opportunity and to be involved with the establishment of an ambitious program. The AHFMP aims to build upon the ABMI’s Human Footprint information to produce and deliver scientifically credible and value-neutral human footprint information to all users, including those outside of the province. The AHFMP is enhancing human footprint monitoring in Alberta to more effectively monitor status and trends in human land use and biodiversity. Its accessibility to the public promotes complementary research to further develop Alberta’s ability to monitor and manage its species and habitats in a changing landscape. Currently, human footprint products, such as the ABMI Wall-to-Wall Human Footprint Inventory is available through the ABMI’s Data Portal (http://www.abmi.ca/home/data/welcome-data-portal.html), and is being expanded to include additional base-layers made available by AEP. Going forward, data and information produced by the AHFMP will continue to be made freely available online, in a format yet to be determined. Stay tuned! * Correction: A previous version of this blog included “seismic” as a feature type updated using the DIDs dataset. DIDs does not include seismic–the blog has been corrected accordingly.